Definition at line 45 of file indifilterinterface.h. Definition at line 28 of file indifilterinterface.cpp. Definition at line 34 of file indifilterinterface.cpp. Definition at line 187 of file indifilterinterface.cpp. Obtains a list of filter names from the hardware and initializes the FilterNameTP property. The function should check for the number of filters available in the filter wheel and build the FilterNameTP property accordingly. The default implementation loads the filter names from configuration file. Definition at line 215 of file indifilterinterface.cpp. Initilize filter wheel properties. It is recommended to call this function within initProperties() of your primary device. groupName Group or tab name to be used to define filter wheel properties. Definition at line 39 of file indifilterinterface.cpp. Definition at line 71 of file indifilterinterface.cpp. Definition at line 112 of file indifilterinterface.cpp. Implemented in CCDSim, INDI::FilterWheel, and QFW. Definition at line 167 of file indifilterinterface.cpp. Select a new filter position. 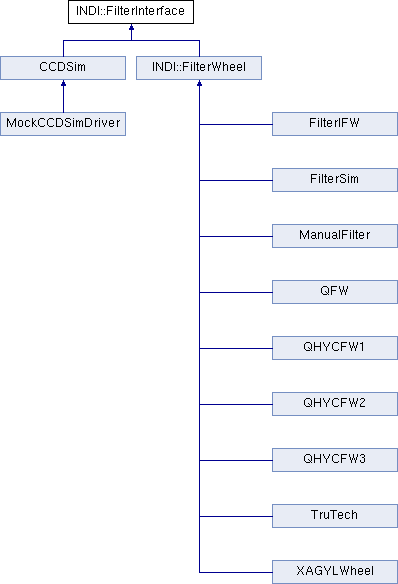 Implemented in CCDSim, FilterIFW, INDI::FilterWheel, XAGYLWheel, ManualFilter, QFW, TruTech, QHYCFW2, FilterSim, and QHYCFW3. The child class calls this function when the hardware successfully finished selecting a new filter wheel position. Definition at line 176 of file indifilterinterface.cpp. Set filter names as defined by the client for each filter position. The desired filter names are stored in FilterNameTP property. Filter names should be saved in hardware if possible. The default implementation saves them in the configuration file. Definition at line 235 of file indifilterinterface.cpp. True if all is OK, false otherwise. Definition at line 48 of file indifilterinterface.cpp. Definition at line 128 of file indifilterinterface.h. Definition at line 126 of file indifilterinterface.h. Definition at line 125 of file indifilterinterface.h. Definition at line 122 of file indifilterinterface.h. Definition at line 121 of file indifilterinterface.h. Definition at line 130 of file indifilterinterface.h. Definition at line 132 of file indifilterinterface.h. Definition at line 129 of file indifilterinterface.h.